Not too many corporate executives would abandon a global president title in a relatively secure corporate environment. 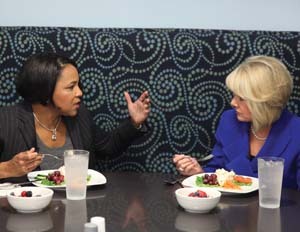 In 2006, however, that’s exactly what Rosalind Brewer did when she accepted an offer to join Walmart–a company in transition at the time, with falling sales and an embattled reputation, particularly around diversity practices. She would take this leap to a new industry and a position far below her previous status. But for the seasoned consumer packaged goods professional, “being uncomfortable” has always been a professional motivator. The fact that Walmart was in the arduous process of re-positioning its brand made it more of a gamble. 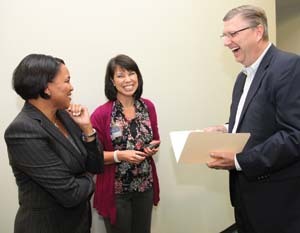 After six months of negotiation, Brewer came aboard as vice president of operations for Georgia–and made swift impact. Managing 140 stores in the state, Brewer became a student of Walmart and its culture, quickly assessing the business, applying strategic focus to her growing real estate, and building her team. She was promoted in four months to president of Walmart’s Southeast division. By 2010, Walmart’s senior management realigned the organization to focus on consumer engagement and increasing scale; it grouped U.S. operations into three distinct areas. Brewer was tapped as president of its Eastern business unit, responsible for generating $110 billion in revenue through the operation of 1,600 stores–from Puerto Rico to Maine–and the management of nearly 500,000 associates. Her next promotion would make history. After Brian Cornell resigned as head of Walmart’s Sam’s Club subsidiary, Brewer was installed as president and CEO of the warehouse club, a $53.8 billion division representing 12% of Walmart’s business. Overseeing management of all its U.S. properties, Brewer, 50, is the first woman and first African American to hold a CEO title at the retailing leviathan, achieving one of the most powerful positions within corporate America. “What she’s been able to accomplish is huge,” says Marlon Cousin, managing partner for The Marquin Group, an Atlanta-based leadership development firm for minority professionals. “Coming from a consumer packaged goods environment, where else could you go and manage that scale of business?” he asks, referring to her former role as head of Walmart’s Eastern business unit. “One hundred billion dollars is equivalent to the size of a lot of [top] companies. It’s just as big as Verizon and almost as big as Bank of America.There aren’t a lot of professionals anywhere who can say they’ve managed $100 billion worth of business.” Brewer now oversees a division with revenues that could place it as the nation’s 52nd largest company. “To put it in perspective, The Coca-Cola Co. is $46 billion. Kraft is $54 billion,” Cousin says of companies with revenues comparable to those of Sam’s Club. With her transition from mass retail to a warehouse club model driven by membership, critics have suggested she will have to quickly achieve the momentum of her predecessor. Having “cut her teeth” in retail stores, she’s aware of the differences, but maintains such an assessment is unfounded. In this new position, she will continue to focus on optimizing business practices, driving innovation, and engaging and satisfying customers. Her management prowess has helped Walmart redesign its business and set the company on a course for even greater retail opportunities, even in the midst of a challenging economy. 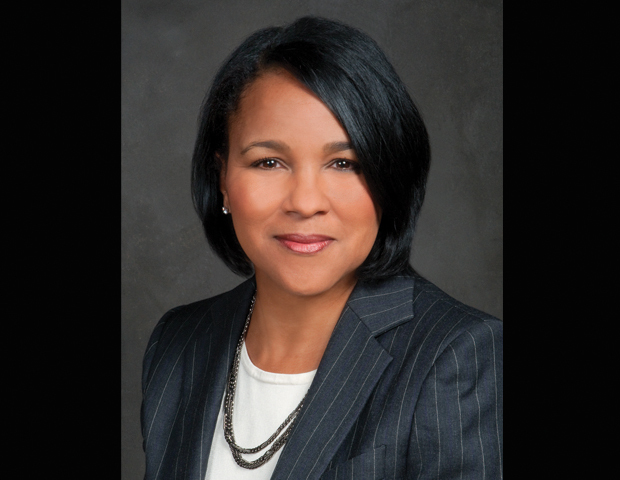 Due to stellar performance, groundbreaking achievements, and a rapid ascent that has made her a transformative leader at of one of the world’s largest and most profitable companies, Rosalind Brewer has been named the Black Enterprise 2012 Corporate Executive of the Year. The move paid off. In 2004, Brewer became president of Kimberly-Clark’s Global Nonwoven Sector, gaining oversight of manufacturing plants in Korea, Australia, Latin America, the U.K., and the United States. Her team focused on streamlining manufacturing operations and driving product innovations with commercial brands such as Huggies and Pull-Ups diapers and Kotex feminine product. The result: sales grew 28% from $900 million in 2003 to $1.15 billion in 2005. As Brewer was transforming into a well-rounded, exceptional corporate manager, her soon-to-be employer, Walmart, was undergoing a major transition of its own. Founded by Sam Walton, Walmart opened as a stand-alone store in Rogers, Arkansas, in 1962. Its rapid growth and expansion positioned it to go public in 1970. 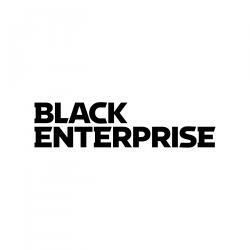 By 2002 it had grown to become one of the nation’s largest publicly traded companies, but the retailer was also beset by a range of allegations that it engaged in unsatisfactory and unfair work policies, resisted diversity practices, demonstrated social irresponsibility, and eroded economic opportunities for small local business. Bad publicity hurt not only sales, but its reputation among prospective employees, especially minority professionals. Upon the announcement of Brewer’s appointment to Sam’s Club, one of the first congratulatory calls she received was from another powerful executive, Ursula Burns, former chairman and CEO of Xerox Corp. “She probably doesn’t know how much I idolize her. I wasn’t breathing while I was speaking to her on the phone,” Brewer muses. “She spent time telling me some of the pitfalls and how to manage myself and how to say no to certain things.” Burns, the only African American woman running one of America’s largest publicly traded corporations, also invited the newly minted CEO to her offices for some extended mentoring. That’s not to say her new assignment doesn’t come with major challenges. There are roughly 1,400 stores in this retail segment among the leaders: Sam’s Club and its two main competitors, Costco Wholesale Corp. and BJ’s Wholesale Club Inc. With more than 600 stores, Sam’s Club has more outlets than Costco, but has much work to do to match its top competitor’s sales volume. Revenues for Costco were $87.1 billion in 2011. Sam’s Club’s sales growth, however, has outpaced that of its parent company. It has expanded 3.9% in same-stores sales for 2011 and 8.4% for 2012. Walmart, which grossed $444 billion in revenues in 2011, has increased same-store sales by 3.4% in 2011 and 5.9% in 2012. Although Ian Gordon, a retail analyst with S&P Capital IQ, does not consider Sam’s Club a meaningful revenue driver for Walmart, he explains that it continues to remain a top performer for three primary reasons: “The club format with a membership fee usually tends to skew toward a higher demographic customer that hasn’t been as stressed [by the economy]. It also has a lot of small business customers.” Inflation prices at club warehouses are also usually passed along to the consumer in the markup of products, whereas mass retailers sometimes absorb increased costs to keep pricing competitive. 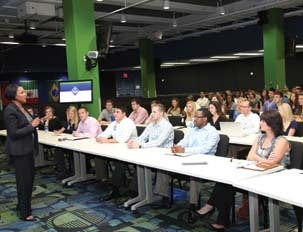 Brewer believes the key to maintaining performance is responding to customer research data and insights, developing a strong e-commerce component for shoppers, providing unique services to members that extend beyond the shopping experience, and offering high-demand, top-quality merchandise, such as Apple products. “You won’t find those at the other clubs,” Brewer explains. Although Brewer won’t yet unveil her plan for how she will expand membership services, she has said that Sam’s Club will continue its relationship with the Small Business Administration. In 2010, Sam’s Club began offering small loans to members through Superior Financial Group and in May of this year, under Brewer, the Sam’s Club Giving Program donated $2 million in micro-lending grants to benefit women- and minority-owned small businesses. In a recent fiscal report for fourth quarter earnings, Brewer announced the opening of 10 to 15 units this year with up to nine of those being new units, which is a significant increase over the three opened in the past fiscal year. Brewer’s tone is consistent–even and calming. She doesn’t shout or swear. “She’s grace under fire,” says Dijuana Lewis, senior vice president of Healthcare Solutions for Walmart U.S. For Brewer, her responsibilities extend way beyond revenues. Managing teams is one of her strongest skills and she acknowledges inheriting a great one that she wants to inspire to drive impact. “Roz has a great vision. She knows where she wants to go and what she has to get done, but importantly there’s a lot of collaboration with that vision,” offers John Boswell, senior vice president of marketing, member insights, and e-commerce for Sam’s Club. Married with two children–a son and a daughter–Brewer, unlike most senior managers at Walmart, has not yet moved to Bentonville, Arkansas, and commutes from Atlanta. On a hot, hectic day in August, she juggles important corporate meetings while planning a family summer vacation–with little time to spare. As such, Brewer manages all of her demands through one integrated calendar, maintaining life at her level is about choices, priorities, and trade-offs.